Once you’ve reached the pinnacle of your profession and made your first billion, why not let everyone know about it? One of the best and most comfortable ways to do that is in the ultra luxurious, ultra quiet, ultra comfortable, and ultra expensive Rolls-Royce Phantom. 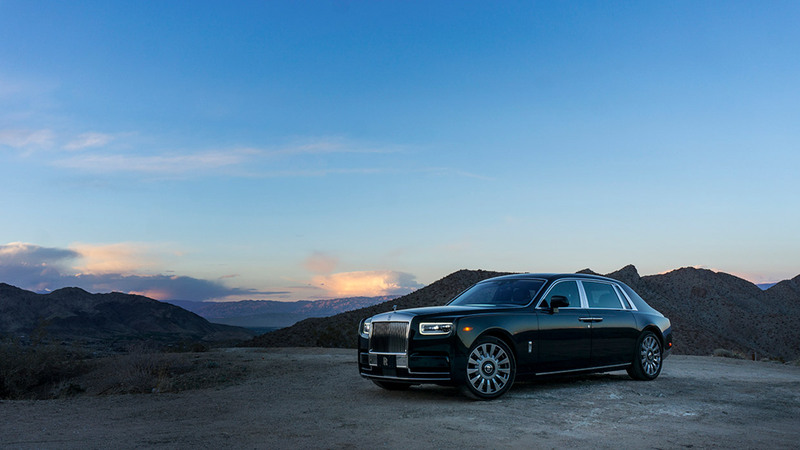 We recently had the opportunity to experience how the .001% lives and drives in Palm Springs, California thanks to the folks at Rolls-Royce. 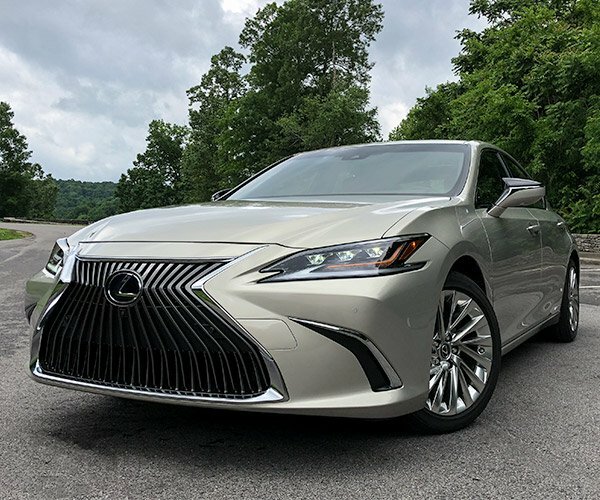 Lest you think we’re exaggerating about that billion dollar number, consider this, the intended owner of this car is expected to have $30 million in liquid assets at his or her disposal. Liquid meaning they can put their hands on the cash tomorrow if they needed to. 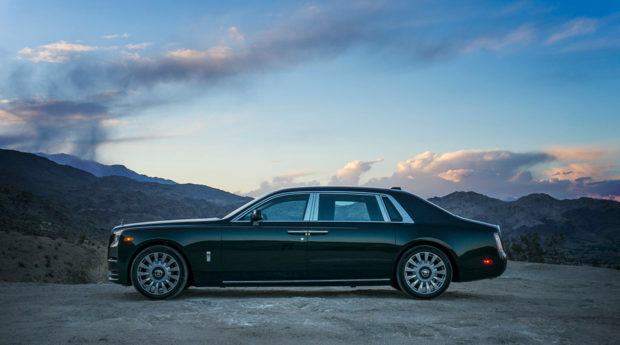 There aren’t a whole lot of people in the world with that kind of scratch falling out of their couch cushions, which is why the Phantom will sell in the hundreds of units per year, making it one of the rarest cars on the road. And Rolls-Royce is perfectly okay with that. 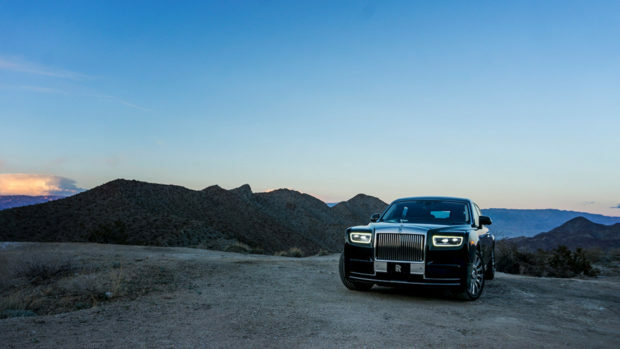 The first thing you need to understand about the Phantom, especially the Extended Wheelbase version we sampled, is that those who buy it rarely drive it. They have people to do that for them. So the best place to start this review is in the back seat, or as its known in Rolls-Royce parlance, the executive suite. 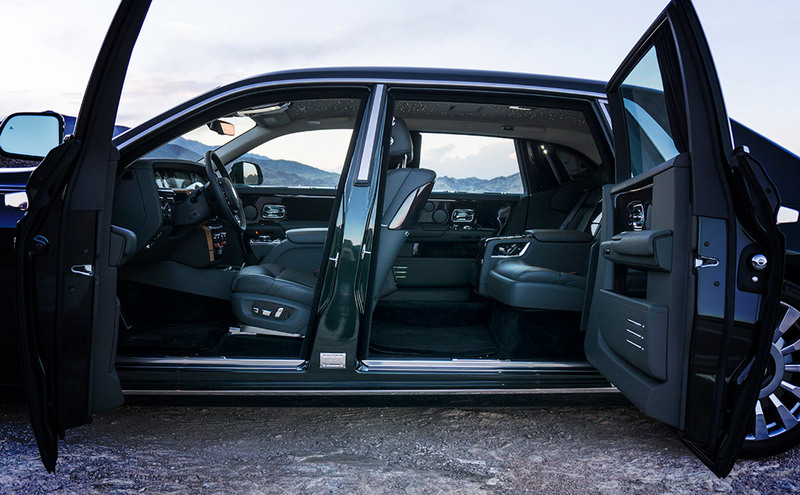 Open the rear coach door and you’ll find an expansive area bigger and more opulent than a Park Avenue penthouse. You can of course customize the lounge any way you’d like. Seating configurations include individual seats with a temporary armrest, a full-width lounge seat, and their new fully-reclining sleeping seat. Our car was configured with two individual seats with a fixed center console that housed crystal whisky glasses and champagne flutes, as well as a cooler for the aforementioned champagne. Both the front and rear seats in our Phantom were heated and cooled, and incorporated a massage function that is the best we’ve ever experienced in a car. 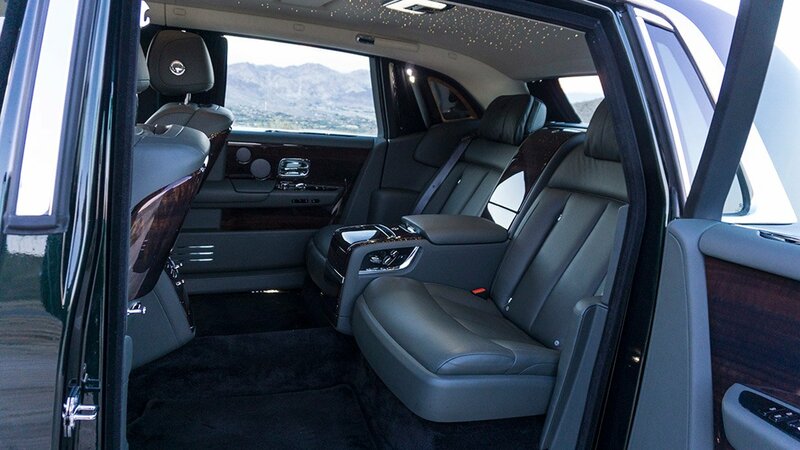 Woven into the ceiling fabric is Rolls-Royce’s exclusive Starlight headliner. This is one of those features that on paper seems gimmicky, but in practice is nothing short of amazing. You can have the “stars” arranged in any pattern you desire – the night sky on your birthday, a specific constellation, or even your corporate logo – and when night falls you’ll bask in the relaxing glow. Productivity is just as important as comfort for those who inhabit this space and Rolls-Royce has thought about that as well. Folding tables appear at the touch of a button from the backs of the front seats. 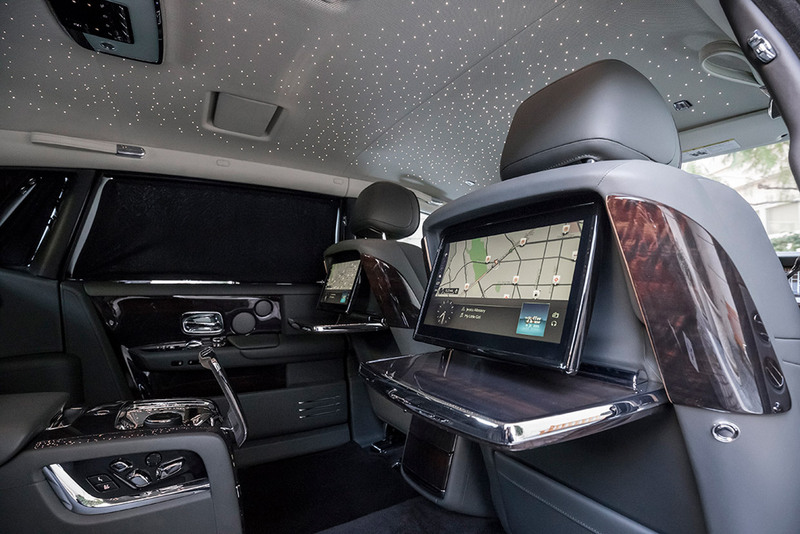 There’s also a video screen in each that provides information about the drive, controls entertainment options, and connects to media via Phantom’s in-car WiFi. You can of course connect your phone, tablet, or laptop to stay in touch with the markets, your assistant, or your private banker in Switzerland. What separates Phantom from all other luxury cars is both the quality of materials and the craftsmanship with which they’re executed. 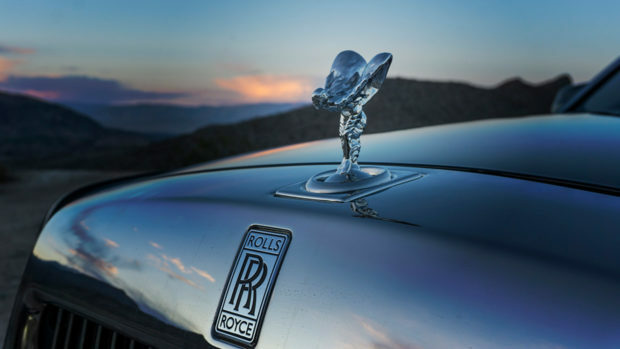 The leather in every Rolls-Royce comes from bulls (no cows, which develop stretch marks) raised in pastures free from fences and trees so there are no scrapes or scars. All of the leather comes from one dye lot to ensure consistency and it’s hand-stitched for a perfect fit over the seats, arm rests, and other surfaces. Wood veneers are hand-selected and book-matched running from the center of the dashboard around to the rear so each piece of wood has a mirror image opposite it on the other side of the car. The look in this particular vehicle was enhanced by the smoked eucalyptus fiddleback wood. Its unique grain pattern and color provided a striking contrast to the gray leather and chrome accents. For those who find themselves behind the wheel of a Phantom, they’ll find much that is familiar, with some significant dynamic differences from the previous generation. The steering wheel and controls are classic Rolls-Royce with a modern twist. A fully digital instrument panel now rests before the driver in place of traditional analog gauges. This somewhat controversial decision is mitigated by excellent user-interface design that replicates the look of the old gauges while making them more accurate, reliable, and legible. Under the hood, the V12 engine is the same displacement as the previous generation, but it has been completely reworked to deliver more power and more torque with a smoother delivery of that power. Acceleration is surprisingly quick. If you’re not afraid of spilling the English Breakfast tea from your porcelain Wedgewood cup, you can sprint from 0 to 60 in under six seconds. More importantly, Rolls-Royce’s new all-aluminum “Architecture of Luxury” provides a ride that is quieter, smoother, and more controlled due to a 30% increase in stiffness. Weight savings from replacing steel with aluminum have been given over to additional sound insulation – nearly 300 pounds total – in all areas of the car. They also worked with Continental to develop tires lined with foam to reduce road noise by 9 dB. All this ensures whisper-quiet operation for the driver and passengers. 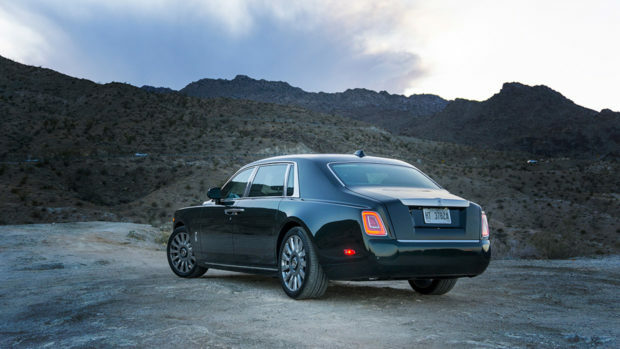 The reworked fully-independent, self-leveling adaptive air suspension system to deliver the brand’s famous “magic carpet” ride, but without as much wallow, waft, and body roll of the previous generation. Hustling along LA’s crowded freeways, we felt in complete control through sweeping corners and on surface streets tight turns were no problem thanks to the multi-link rear suspension and four-wheel steering. 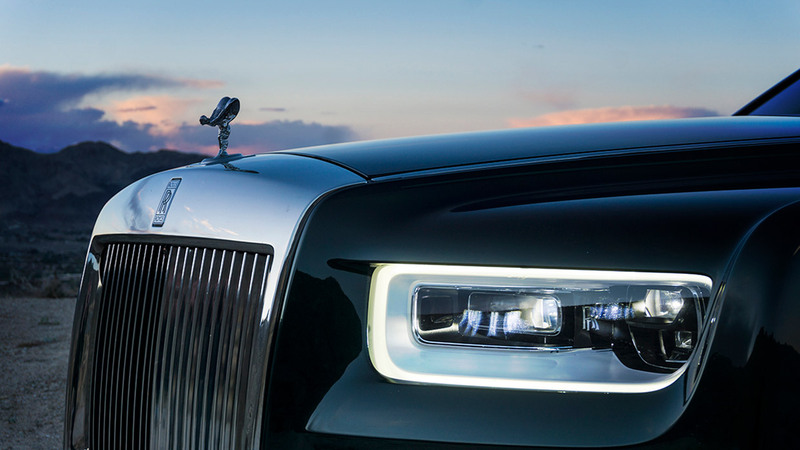 The Phantom’s exterior retains its traditional appeal. The parthenon grille and Spirit of Ecstasy hood ornament ensure there’s no mistaking this car’s pedigree. There are concessions to modernity including slim all-LED lighting and a shark fin antenna for the satellite radio. 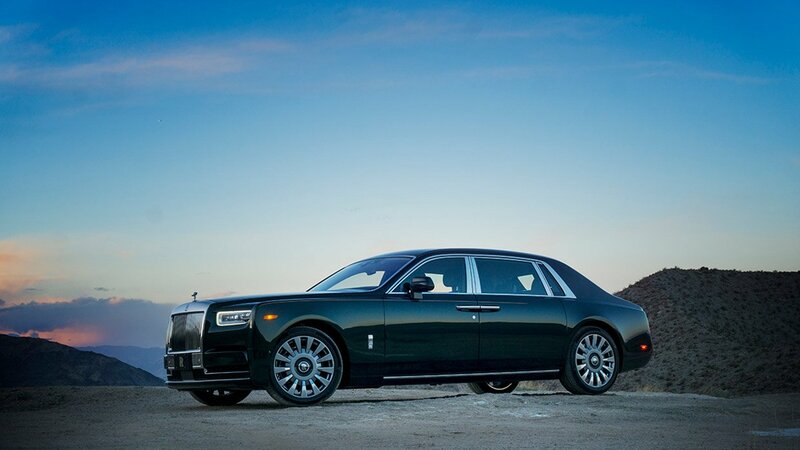 Phantom’s chiseled panels and classic three-box design looks as solid and substantial as it drives. It all comes together to make the statement someone spending north of half a million dollars on a car desires. And in the end, that matters just as much as, if not more than how it drives.